Want to reverse your motorhome like a professional? Practice can certainly make perfect, but there are still also plenty of ways of preventing things from going wrong and potentially costing you lots. 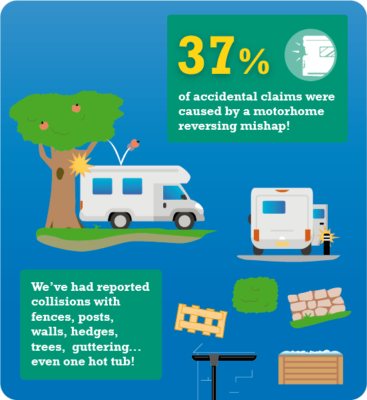 Every year we deal with numerous accidental damage claims and in the last 12 months, 37 per cent of these claims were caused by a reversing mishap. Fencing, posts, walls, bushes and trees are often the culprits – even a hot tub – and there are also some instances where the driver has opened their door to get a better look and then damaged it when moving back with it still open. 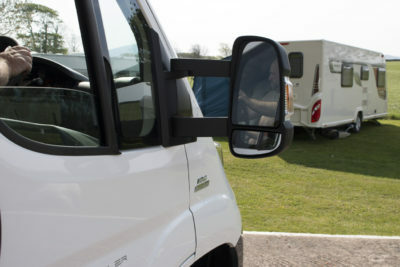 First, don’t forget the best reversing guide of all – if you’re lucky enough to share your motorhome adventures with a partner, the help they can give when they leap down from the passenger’s seat to guide you into a tight spot is surely the best! Of course, there are also accessory add-ons you can consider, to make things all the easier. Reversing sensors, cameras and more. Most motorhome workshops are pretty adept at fitting such features. Plenty can also be fitted by a competent DIY-er (although make sure any holes you may have to drill don’t invalidate your motorhome warranty first). 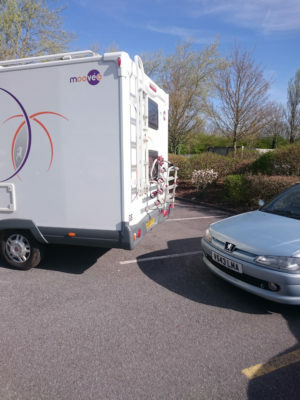 However, before you have any reversing aid fitted, check with us here at Caravan Guard – you might be in line for a discount on your motorhome insurance premium. When fitted to new motorhomes, our stats show that customers with a reversing camera or sensor fitted are nearly 18% less likely to have an accident. But, if you have one, make sure you do listen or take notice of the warning signals, however annoying they might be. We were shocked to discover that many accidental damage claimants had reversing aids fitted to their motorhome but chose to ignore the dangers behind! Like any vehicle, it can be surprising how just a minor scrape can cause a whole lot of damage. Worse, if coachbuilt bodywork is pierced, or joints forced apart, there’s the potential for water to get in and do a lot more long-term damage. There are pluses, though. Typically, you sit much higher in a motorhome cab, so you get a better view of what’s around you. Also, door mirrors tend to be excellent, offering far superior views to those of a car. 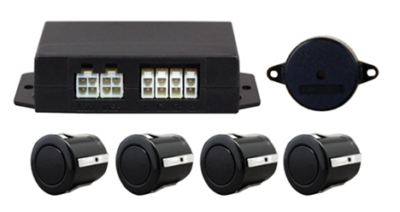 Reversing sensors, like camera kits, are also a helpful aid to reversing. They shouldn’t be treated as a complete solution, however. There’s always room for some plain common sense. We asked David Burley, founder of the Motorhome Academy, for his advice on motorhome reversing. “There’s always a certain trepidation associated with driving a larger vehicle than normal and motorhomes are no exception,” said David. “A typical motorhome owner might have a small runaround car, but then periodically they step into a vehicle two or even three times the size for short breaks away. Add to this the possibility of them driving this larger vehicle on foreign roads on the ‘wrong’ side of the road then the fear factor rises considerably. Use your passengers. If you have anyone in the motorhome with you then they can be your eyes and ears behind. Get them out behind the vehicle to one side so that you can see their gesticulations in your side mirror. Have a set process of hand gestures in place before they get out as to what constitutes reversing is safe, move to the side and, most importantly, stop. They should be keeping a watchful eye above as well as to each side and to the rear. Never get them to stand in between the vehicle and a solid unforgiving obstacle such as a wall or another vehicle in case you slip on the clutch or similar and the worst-case scenario occurs! 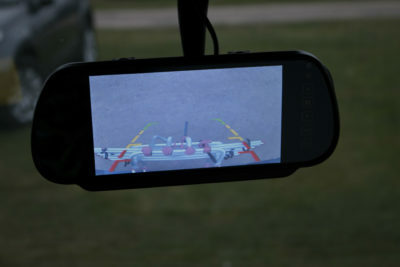 Fit a gadget to help with rear-view vision such as reversing cameras. These come in different variants but all models nowadays have colour screens/camera lenses, single or twin camera lens versions and ordinarily 5in or 7in screen sizes. 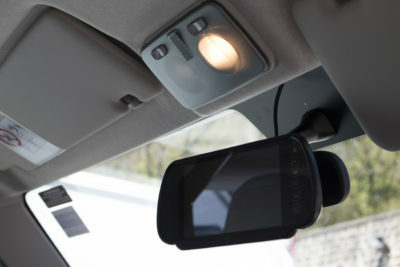 There are even versions on the market which allow the screen itself to be clipped to an existing windscreen-mounted rear view mirror. Funnily enough, the number one piece of advice is to try and get into a situation where you don’t have to do any reversing at all. Consider all angles. There’s no harm in getting out and having a good look around before you attempt any reversing. Slow things right down. The slower you make any reversing manoeuvre, the easier it becomes… and the less likely you are to cause major damage. Look high as well as wide. Don’t forget, your motorhome is so much taller than a car. There may be high-level obstructions you don’t want to encounter, like trees, a parking porch or guttering. Know the height and width of your vehicle. It’s worth having a handy sticker in your windscreen or sun visor. All Caravan Guard policyholders get a windscreen sticker that has room to write your motorhome dimensions as well as other bits of key info. Know your blind spots. All vehicles have them. You need to be aware of yours. Take into account of any fittings to your vehicle beyond your field of vision, such as bike racks, towbar etc. Consider how to protect any camera fittings. You don’t want them in a location where they can get accidentally damaged. Nor do you want the lens picking up road dirt and obscuring any views, whilst also being hard to get to for cleaning. Let your sat nav help you. Make sure it’s programmed with your vehicle’s overall dimensions and it means there’s less chance of you getting into difficult situations that might involve tricky reversing. *Go on a course. Both clubs offer one-day courses specifically on motorhome manoeuvring, using highly qualified instructors who are often motorhome users themselves. And they’re not just designed for newcomers. The Motorhome Academy also runs courses for those wanting to get the most out of their motorhomes. Find out more at www.motorhomeacademy.com. West Yorkshire-based dealership, Richard Baldwin Motorhomes, scored something of a first when it announced its special edition range for 2017 would come with an exclusive fitting. 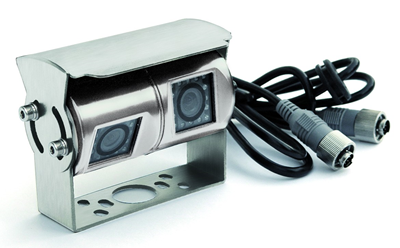 The DPS360 is a unique CCTV/alarm/manoeuvring system which includes fitted cameras so you can see all around your vehicle without leaving the driver’s seat – making it perfect for reversing as well as offering all-round security. 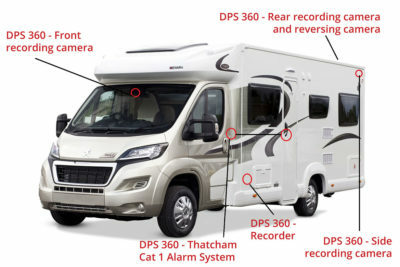 There are plenty of reversing cameras out there for motorhomes, but it’s dual-lens models like this that are growing in popularity. This top-of-the-range model is designed to fit with a number of other Snooper monitor/satnav devices. It includes a dual-lens Sony camera with infra-red LED night vision. The twin lens set-up means each can be pointed in a different direction for a superior view. The kit also includes AV connector cables, with a 20m extension, splitter box, video controller box, bracket and shield. Total weight is 545g, power consumption is 4 watts. Reversing sensors like this are ideal for giving an audio warning as you approach any previously unseen obstacles. These are marketed as “intelligent”, too, in that it can identify fittings on your vehicle such as a towbar, bike rack, and even a trailer. As sold by RoadPro, this also comes with a visual display. As well as the black finish shown here, these are also available in white or silver. Detection range is 150cm to 95cm. 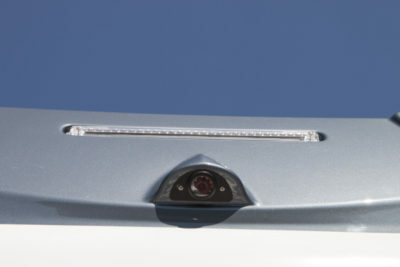 Click for more information on motorhome reversing cameras and parking your motorhome. *DPS 360 discount includes 19% Thatcham Category 1 approved alarm discount, 2.5% dealer club discount, 2.5% reversing aid discount plus an exclusive 1% 360 degree CCTV discount. Club discount is available to customers of various organisations and can only be claimed once per policy term. Minimum premiums apply. Subject to underwriting terms and conditions. We reserve the right to withdraw offers at any time. To apply your discount online: Select Richard Baldwin Motorhomes as your convertor, select reversing camera, tick Thatcham Category 1 alarm and tick to say that you’re a club member. We’d love to hear about your reversing tips, aids and even mishaps in the comments below. I think the advice given are the obvious tools that one can fit, camera, sensors etc. I have cameras fitted, wife`s invaluable help she said. I would have expected you to advise about pivot points, where the pivot point is and if it differs on various vehicles and what to look out for. Very good article but when I have to reverse the Wife gets out to watch the rear and the first thing I do is completely open both fron windows so any warnings/Instructions can be heard above the engine. This article very informative and seems best option is reversing camara. It is more difficult to reverse into driveways with steep incline. Best option is using another person to give directions. I think I will invest in a set of Walkie Talkies. Our reversing camera does not cover the full width of the vehicle, therefore there are blinds spots each side. The sensors target the ground and not whats overhead. You need one on top of each corner to be safe. I use a walkie talkie with my wife, and this is the ONLY time I ask her to keep talking, ok ok ok stop. Nothing worse than using walkie talkies and they forget to speak constantly into them. First tip should always be slowly. Be ready to be bloody minded about slowly, dont be panic-ed. Relax. Avoiding reversing is not a good tip, you will have to. Early on we were required to reverse down a ferry ramp, we had no real skills. Reversing camera in pitch black and drizzle useless. We have found that communication is an issue so the passenger staying in the vehicle and using the rear windows enables an ordinary conversation to be had -safe enough after all you are going a walking pace or less. When passenger is outside the vehicle (our new one wont have such good windows) we have found a walkie talkie to be excellent -again it enables a conversation rather than hand signals. Surprisingly it is fully audible just laying on the passenger seat so hands free. Now consider essential. Works in the dark too. Practice in a car park and using white lines learn how the vehicle swings on a hard lock, Our Sevel (Peugeot/Ducato) PVC turns at about two meters behind the vehicle: BUT in addition it swings about two meters away from the turn at the front (left turn, front moves to right…a lot). Thanks for those tips Mark. The walkie talkie idea is great. all the above advice omitted the risk of tail swing.the body rear overhang.It is frequently forgotten when turning or manouvering.I have experience of this, both with a motorhome and more recently when a Danish caravanner turning sharp left out of a campsite access road.His wife was at the front watching his o/side clearance,no thought given to the back of the van,which hit my caravan towbar,swinging it around,off the steadies,and dragging the awning with it.This happened twice in a week.I was set up on the corner pitch next to the T junction,as per instructed.with a hedge to my right.The Danish driver was totally unaware of the incident until I chased after him in my car.Fortunately,no damage to my van.